The 1911 Canadian Northern Railway Depot and thirteen spectacular heritage gardens are home to dozens of events for the whole family. Many families originally arrived on the prairies by train. Now the Camrose Heritage Railway Station & Park offers intergenerational events all year long including a Victorian Luncheon & Garden Tour, story-telling and a Tribute to Prairie Women. Children can play to their heart's content in the Secret Garden. History and artifact lovers will be entertained for hours on their own or with a personal interpreter. After the tour, relax in the tea room and browse the gift shop. (See also page 21). Games on May 18-20. Don’t miss the Jaywalkers Jamboree on June 1-3. If you love planes you’ll want to be in Camrose on July 17-19 as the Canadian Forces Snowbirds will be soaring over the city! On July 21 the Lucky Highway 13 Poker Rally is coming to the city. You’re invited to come along and win great prizes. 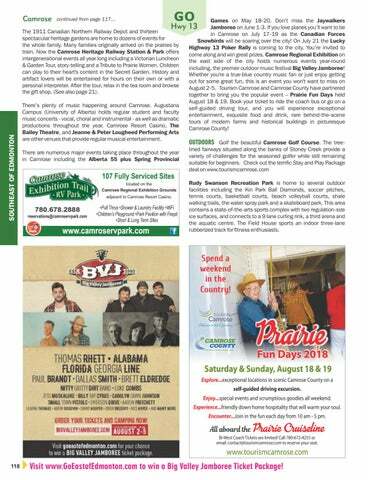 Camrose Regional Exhibition on the east side of the city hosts numerous events year-round including, the premier outdoor music festival Big Valley Jamboree! Whether you're a true-blue country music fan or just enjoy getting out for some great fun, this is an event you won't want to miss on August 2-5. Tourism Camrose and Camrose County have partnered together to bring you the popular event – Prairie Fun Days held August 18 & 19. Book your ticket to ride the coach bus or go on a self-guided driving tour, and you will experience exceptional entertainment, exquisite food and drink, rare behind-the-scene tours of modern farms and historical buildings in picturesque Camrose County! Rudy Swanson Recreation Park is home to several outdoor facilities including the Kin Park Ball Diamonds, soccer pitches, tennis courts, basketball courts, beach volleyball courts, shale walking trails, the water spray park and a skateboard park. This area contains a state-of-the-arts sports complex with two regulation-size ice surfaces, and connects to a 9 lane curling rink, a third arena and the aquatic centre. The Field House sports an indoor three-lane rubberized track for fitness enthusiasts. Fun Days 2018 Saturday & Sunday, August 18 & 19 Explore...exceptional locations in scenic Camrose County on a self-guided driving excursion. Enjoy...special events and scrumptious goodies all weekend. Experience...friendly down home hospitality that will warm your soul. Encounter...Join in the fun each day from 10 am - 5 pm. Bi-West Coach Tickets are limited! Call 780-672-4255 or email: contact@tourismcamrose.com to reserve your seat. 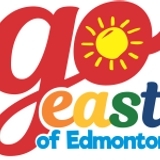 Visit www.GoEastofEdmonton.com to win a Big Valley Jamboree Ticket Package!